Goodmorning, I am Larissa from Car-d-elicious and today it is my turn again to post something on the blog from Gerda Steiner designs. 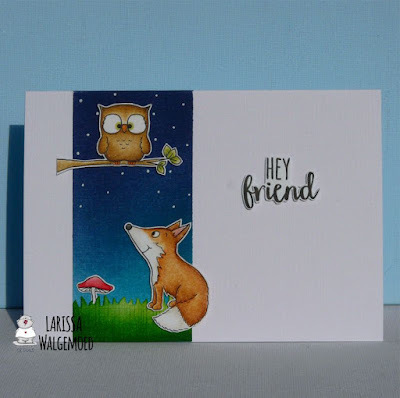 This time I made a card with the new stampset Foxes from Gerda Steiner designs. I have stamped the image of the owl, fox and mushroom and then I coloured them all with my Polychromos pencils. I have fussy cut all the images. On a whie card I used masking tape to create a strip and I coloured it with Tumbled glass, Broken China, Peacock feathers, Faded jeans and Chipped saphire distress ink. From white cardstock I have die-cut a strip of grass with the Grassy hills die-namics from My favorite things. I used Mowed lawn and Lucky clover distress ink to colour the grass. I glued all the images and the grass on the card. 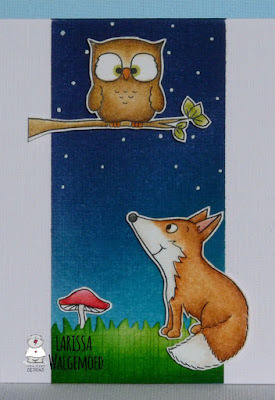 I stamped a sentiment from the set Foxes from Gerda Steiner designs on white cardstock and fussy cut it. I used foamtape to adhere it on my card. With a white gelpen I added some dots on the coloured strip on the card to make it look like a starry night.